This time of the year, lots of tech companies have one question to answer: Is it worth attending Web Summit or not? Many claim that Web Summit has grown so large in the last couple of years, that it is impossible to get good results for your company. Others claim that it’s a bit too expensive and there is not much that a company can gain from attending Web Summit. Well, from the Oveit experience of Web Summit 2015, where we were an official Alpha Start-up, we can say that it’s definitely worth it and we’ll tell you why, how we managed to have such an amazing experience and why we’re looking forward for Web Summit 2016 in Lisbon. For a start-up that wants to succeed in the tech world it is important to be there and get a feeling of the market and like-minded people. And what other place is better than a place where you can meet everyone and get updates regarding everyone else’s activity. At Web Summit there are lots of Alpha start-ups from different countries that develop new apps or gadgets for different industries. You’ll find e-commerce start-ups, AI start-ups, gaming start-ups, medical (tech & apps) start-ups, etc. Besides the start-ups, the official numbers are: more than 50.000 attendees, more than 7.000 CEOs, more than 15.000 companies from more than 150 countries. So yes, it’s huge and there are lots of opportunities. You can meet companies that have the same market as yours, you can network, gain access to new markets and partner with people from all over the world and, in case you want it, you might even get to know an Angel Investor or a VC. Every attendee that goes to Web Summit will receive a badge. As an Alpha Start-up you might want to keep an eye on the Investor Badge, color coded with red in 2015. If you’re raising capital, this is a great way to meet an investor and give him a short pitch. Careful: this means that there are hundreds of others like you on the lookout for those Investor badges. They usually walk around the stands and look at the companies. If they’re interested they will approach you, but it’s important to get their attention and give them a fast and precise presentation of what you’re doing. Remember, your pitch is the key. On the other hand, there’s a trick that nobody will tell you at Web Summit. Usually, the Investor Badges are the most desired and sought after. This is why many important investors have stopped wearing them. I’m sure that you can understand that being approached by hundreds of people is not extremely pleasant, as many investors want to take their time into studying the companies that might be interesting for them. So, the badge can be deceiving. Therefore make sure that all the people coming to visit your stand are offered a pleasant experience. You never know how you’ll meet your Angel even if he doesn’t wear an Investor badge. Use the app and mind the internet! 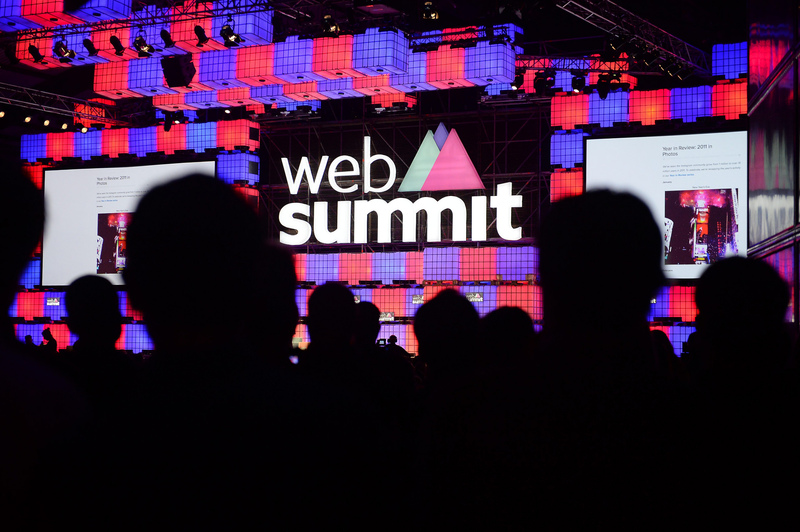 All Web Summit attendees gain access to the Web Summit app. With this app you can contact other people that you might want to meet and you can set up private meetings. However, there’s one trick to the app. It requires internet and internet is one tricky thing to have at Web Summit. Now we don’t know how the Internet will be in Lisbon this year, but you might expect that having tens of thousands of people accessing the event’s wi-fi is less than perfect. Our solution? Linkedin. If you want to get in touch with people, connect with them before Web Summit and contact them via Linkedin during Web Summit. Last year, Linkedin was a great choice for many looking for networking opportunities. The key to good networking is the business card. Make sure you bring a lot of business cards with you. You will be handing them out with the speed of light. Make them stand out. There will be so many business cards going around that if you manage to make yours stand out from the crowd, people will remember you, or at least they’ll have a memory of your product/company. Having set up an Alpha or Beta Start-up Booth, expect a lot of people visiting your stand and offering business cards. Make sure you jot down with key details about your interaction with the people you are interacting with. It will help when you’re going to follow-up on a potential lead. And one more thing… freebies! Everyone likes freebies, so if you have the budget to make some goodies, do spend it. It’s worth it! From power banks to t-shirts, freebies will make people remember you. Keep your eyes and ears open. Opportunities might be everywhere! There’s a lot of things to do at Web Summit and there are lots of places to visit. You will bump into people that might be interesting for your app everywhere, from the cafeteria and up to the venues where lectures are being held. Make sure you mingle and keep your eyes open to spot any interesting name/company on the badge. Also, the major companies (such as Google, Facebook, etc) have their own big stands so you will be able to get in touch with them quite easily. Another important part of Web Summit is to party. Yeah, you heard it right, go wild at parties. Every night there is a party held in one venue. Make sure you’re there and interact with everyone. And have fun. There’s no place better to connect with people than the place where everybody is relaxed and open to conversations. Grab your drink and mingle. Last but not least, be open to discussions about your product/company anywhere you go. If you’ve been browsing our blog and went through the articles, you might’ve bumped into one titled “5 Tips for the Perfect Event Badges”. At the end of the article we mentioned a little secret that could help you out with the badge creation for your event. And that secret is, obviously, Oveit. 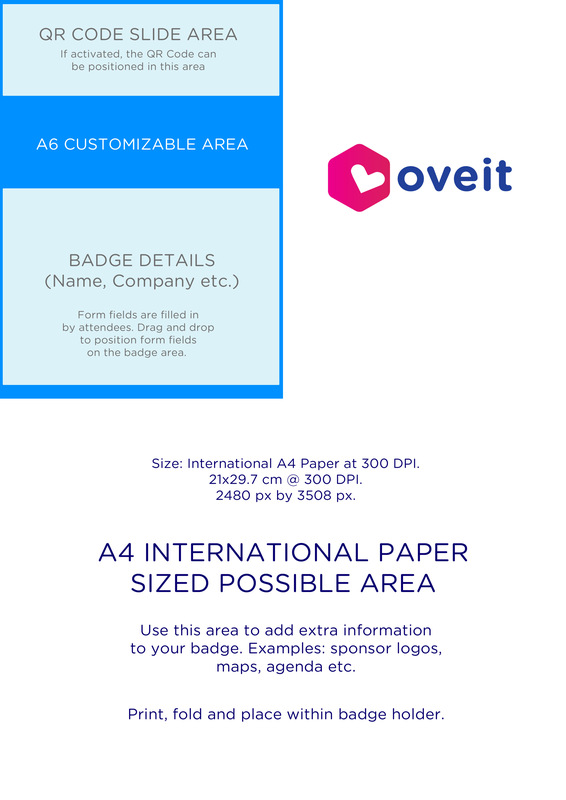 In the following article we’ll be going through the step by step process of creating badges for your event using our Oveit event management app. The first thing you have to do is set up your event. Here’s a brief tutorial on setting up your event on Oveit. However, setting up badges is related to this part so the first elements that you have to activate are found in the additional options of the first step: Enable registration forms and Enable attendee badges. Mark them both. Forms help you collect attendee data. This data is afterwards printed on personalized badges. After you click save, a new tab shows up: Registration forms. Yay! Now you can collect data from your attendees. Here, make sure that you mark as Mandatory all the information fields that you want your attendee to have on his badge (Name, Company, Position in Company etc.). Data recipients, which is optional. Here you can enter up to 3 email addresses that will receive updates when forms are filled in. The form fields. This is where the magic happens. This is where you actually set up your form. You can choose from text fields, dates, emails and such. But for the purpose of our badge setup tutorial, let’s just focus on “text”. For example I chose two text fields I want my attendees to fill in and shown on their badges: Name and Company. Save and continue setting up your event. When you go back to your events dashboard you will see that the event has a new button next to “Tickets”. It’s called “Badges”. Click on it and you will be taken to the Badge design tool. The first thing you see is a blue message: “You haven’t created any badges for this event.” Time to fix this situation. Click on the “New badge” button located in your top-right corner. This will take you to step 1. Step 1 – Who receives a badge and how will they be able to download it? Once you’re at Step 1 you will first have to choose what ticket is associated to the badge. You can opt for a specific ticket (to create a specific badge – such as VIP Badge or Press Badge) or a badge for “All tickets”. 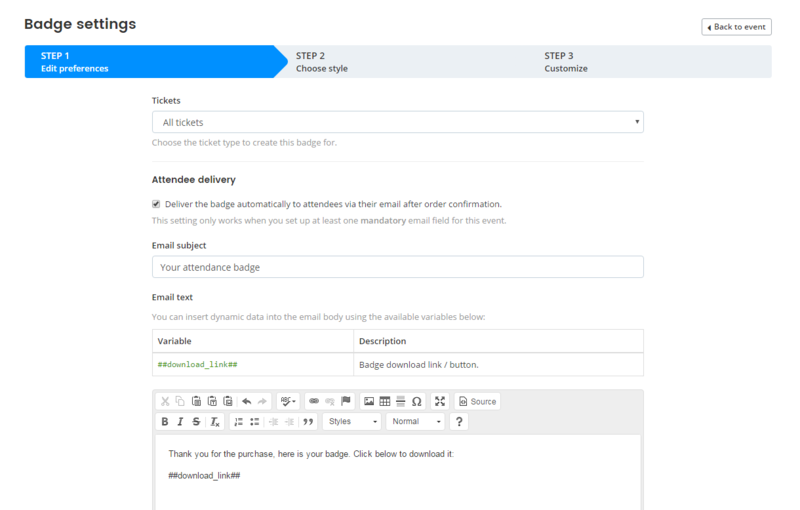 The next thing you have to check is whether you want to deliver the badge automatically to attendees via their email after the ticket order is confirmed. This will work only if you have set up at least one mandatory email field for this event. If you choose to send the badges via email after order confirmation, you can choose your own Email subject and Email text. It is important that you add the ##download_link## variable to the Email text. That is where your attendees will click to download their badge. So regardless of what you want to communicate to your customer, make sure you add that variable to the text. Step 2 is the Badge style. You can choose one of the four standard badge sizes and formats. These are generally used for all major events so we’re sure that one of these will suit your needs. Once you chose your style, go to the next step. Step 3 is the last and most important one. Here you actually configure your badge. You will see an image of your badge to the left. To the right you can upload a background that you previously create (this is something created specific for your event). The maximum file size is 4MB and it should be a jpg, jpeg, png or gif. The background design is your choice: you can add sponsors, details, logos, information, maps of the event, anything that you want to appear on the badge of every participant (or of the specific category of people that have access to this type of badge). Here is an example: Even though the A6 badge area is the only customizable section, you can add a larger background, of up to the size of an A4 paper (at 300 dpi). 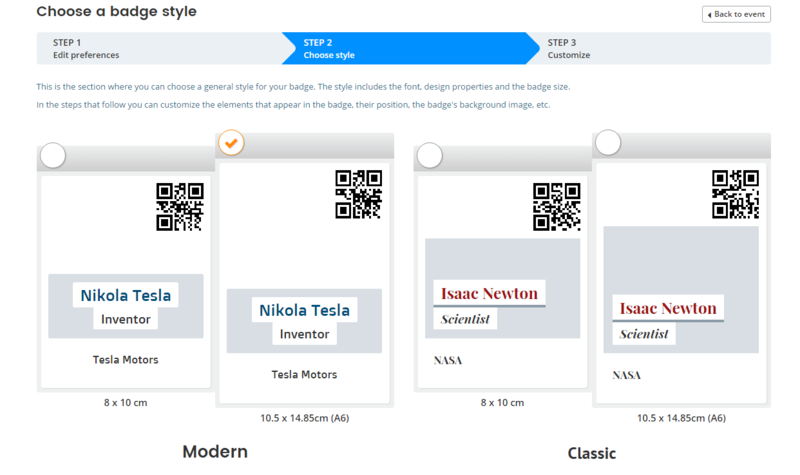 Click on the image on the right to get a template which you can use to customize your badge. The general areas are outlined so you can see where the content goes. You can actually print an A4 badge, fold it two times and slip it in a lanyard holder. Next, you can activate the QR code if you want to scan attendees by their badges. You can move the QR code to the left or right of the badge, as you prefer it (you can also make A4 badges, where only the upper left part will be editable, the rest is your design and when someone receives it, the badge can be folded and placed into the plastic pocket he usually receives at the events’ registration desk). 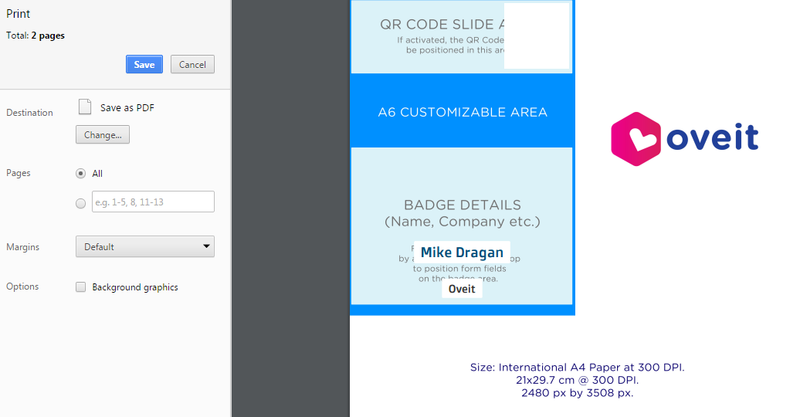 Drag and drop form fields to show on the badge. Activate and move around the QR code to fit your needs. Finally, you will have a list of the Mandatory fields that you previously created in the Registration Forms step. Here you can drag whatever field you want on the badge and arrange it any way you want. Once you’re done with this, Save your badge and that’s it! You’re done! Simple as that. In less than 5 minutes you can create a badge that will be available for everyone who registers (or buys tickets) at your event. Now all those long hours spending time to create special badges for every attendee are gone. Of course, if you want to create more badges just repeat the process I’ve just described and you can have as many badge types as your event needs. The attendee has several options now: He can print his badge at home and come with it to the event or someone from your staff can print the badge when the attendee comes to the event. That is simple as well. Just go to the Events dashboard, click on the “Check – in” button and you will be able to search and find the attendee by typing his name or other form details. Once you find him, you can click on the Print Badge button and that’s it. The badge is printed and your attendee can now enjoy the event. Hope this was useful. If we can help you further, please let us know. Even though the Olympic Games have ended, there are still some sport events worth watching or even attending this fall and winter. Therefore, here is a selection of the most interesting events that will take place around the world, the following months. Eight teams – Team Canada, Team Czech Republic, Team Finland, Team Russia, Team Sweden, Team USA, Team Europe and Team North America – will compete in a best-on-best international hockey championship – a two-week tournament, featuring more than 150 of the best players in the NHL. All tournament games will be played at Air Canada Centre in Toronto, home of the NHL’s Toronto Maple Leafs. On race day, runners from all 50 states and more than 100 countries will set out to reach the finish line in Grant Park. Besides the fact that running is known to be very healthy, you can also help the ones in need, by running for a charity. The 2016 Bank of America Chicago Marathon Charity Program has more than 170 official charities. Every charitable organization allows its team of runners the unique opportunity to make their Marathon experience more meaningful by not only accomplishing a personal goal on race day, but by contributing to a larger mission and giving back to a worthy cause. The Barclays ATP World Tour Finals features only the world’s best eight qualified singles players and doubles teams as they battle it out for the last title of the season. Players compete for Emirates ATP Rankings points throughout the season in a bid to earn one of the eight coveted berths. Played using a round-robin format at The O2 in London, each participant plays three matches as they compete for a berth in the knockout semi-finals and beyond. An undefeated champion earns 1,500 Emirates ATP Rankings points. Total prize money offered is US$7.5 million. In December 2016, Windsor (Canada) will welcome up to 1,000 of the world’s top swimmers from over 175 countries, to compete in the 13th edition of the FINA World Swimming Championships (25m), for 46 gold medals over 6 days. Meeting people and making new friends: the key to every successful event out there. But for some of us more introverted types there is this fear of events, especially business ones, as meeting and engaging new people can be tiresome. Have you ever gone to a big event where you were supposed to promote your business or perhaps attract an investor and you felt like a tiny fish in an ocean full of people? I’m sure you did. We did too. I’s not just huge events … the same feeling can occur even after a conference or a dinner, when it’s time for “networking”. First of all, you have to know that when it comes to networking, some people got the natural skills, some don’t. It’s simple as that. But that doesn’t mean that people that are shy or introvert cannot be skilled networkers. OK, now let’s assume you are one of the people who are not comfortable when it comes to attend an event and start networking. Here are five tricks that will help you improve your skills and achieve what you want when you go to an event to meet people. First thing’s first. When you plan on attending a new event – you have to be informed. And when we say informed, we don’t mean to know information about the event. Well, that is useful too, but first of all you have to try and find out who is going to be there. Who are the people you want to talk to, what do they do and how do they look? Do you know someone who will be attending the event? Someone that might introduce you to others you may want to meet? Let’s assume that you are going to a conference where you want to meet an important investor.You know that he is coming to the event (so that’s the first piece of information that you must have) but you don’t know anything else about him, except his position. So now it’s time for research: Google, LinkedIn, Facebook, anything works. This way, you can find out important details about the person you want to meet. Besides professional information, you might even find details about his personal life, such as hobbies. All of this information will help you get to know the person better, feel a little bit more confident and provide you with some good conversation subjects in case you get the chance to do that. Also, every major event has a dedicated app for networking. You might want to use this before the event starts so you can set up some good meetings with people you want to meet. Networking is all about you. The more confident you are, the better the networking. It’s pretty hard to start chatting with someone who is shy, introvert and reluctant to interact. So, plan your event, locate your “targets” and follow the dress code. That’s pretty important. I know that sounds a bit rough but fitting in is a good choice when attending events. The difference you want to achieve is in your speech and attitude. Rather be known for your character and personality than your funky choice of styling. Prepare some clean-looking business cards and don’t be shy to share them. Choose the right people and engage them before giving them the card. Nobody will remember your card unless they are interested in you. 3. Where are the drinks? If you go to conferences or large events, make sure you know the location of the bar or cafeteria. That’s where people are relaxed and approachable. Many are attending the event to do exactly what you want to do, so don’t be shy to sit at a table with other people. The drinks, sandwiches and cakes are a good way to break the ice and start a conversation… or if you’re a smoker, always be prepared to light someone’s cigarette. Who knows, maybe that person will be just the guy you need. And the best advice is that you must always be prepared to meet the people. As a personal example, when we were networking to find people interested in Oveit, we happened to meet a potential investor on the airplane, sitting right next to us, as we were coming back from a major event. You never know whom you’re going to meet or whom you are going to talk to, so it’s for the best you are ready for it at all times. Considering you do everything right, by the time the event finishes, you will have a lot of business cards. You might want to sort them out as soon as possible. I found out that using a pen to scribble some extra details on the business cards can help a lot. You might remember all the details of everyone on the business cards from the event, but what’s going to happen in a couple of days? Memory can sometimes be a pain, so it’s best to avoid the problems by jotting down extra information about the people on the cards. And it might help to use different pockets to place the cards. For example, you could put the very important business cards in the right pocket. Simple and easy to do. The hard work comes when you have to follow up. You attended the event, you’ve met the right people, maybe a lot of them… but so did they. So, now it’s time to follow up and approach each and every one of the people you are interested in. Make sure to write effective and short e-mails. Remind the person about the circumstances you interacted and be sure to remind him or her the information that got him to give you his business card in the first place. If you want to ask that person for something, don’t do it now. Ask him for an advice and meet up later. It’s the best follow up you can have. However, beyond all the advice and tips that you might read online there is one thing and one thing only that will help improve your networking skills: Practice. Yes, this is the most important trick of them all. Go out there, attend as many events as you can and work on your networking skills. You might not make it the first time, you might go horribly wrong the second time, but if you learn from your mistakes and continue being tenacious, you will definitely succeed. After all, “an ounce of practice is worth more than tons of preaching”. How to start a new event with Oveit? So you decided to use Oveit for your events. First of all, we would like to thank you for choosing us. We’d tell you what a great solution Oveit is, but instead we will invite you to start using it and then we’d like to hear from you, in case you liked it. Let’s get started. This will be a small tutorial spread into different parts regarding the different functions that Oveit has to offer. Each part will offer you insight regarding a specific function and how to use it properly so you can make the most of our platform and enjoy using it. The first thing you will see when you access your Oveit account is the dashboard. Basically here you will see important information regarding your ticket sales. For detailed reports on sales and tickets sold, you can click on More reports and you’ll access the Reports function. We’ll talk about that in another part of the tutorial. Now, let’s move on to creating an actual event. You can either click on the button My events and you will be taken to the Event Management chart or you can click on Create an Event button and this will take you to the core part of Oveit. You’ll see that creating an event is extremely easy. 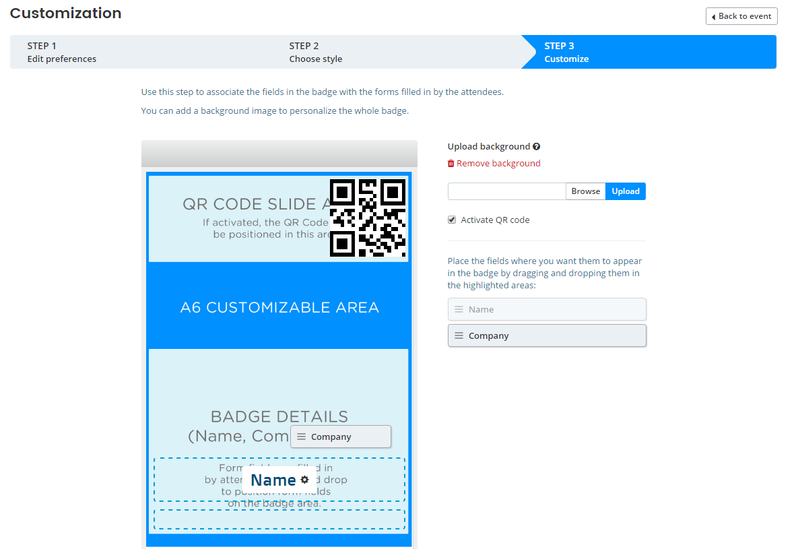 You have 4 main steps and two other ones in case you want to use two additional functions: Registration forms and Badge design (we’ll speak about these in two other parts of the tutorial). The first step is entitled General Settings. Here you create the general features of your event such as the event’s name. After you enter the name of the event, you’ll see that there are two options regarding your event: No seating and With seating. If you click on the No seating button, then there will be no venue seating chart attached to your event. That means there are no seats assigned to the tickets. All you have to do now is enter the Location of the venue where the event will take place, place it on the map (Oveit uses Google Maps) and you’re set. 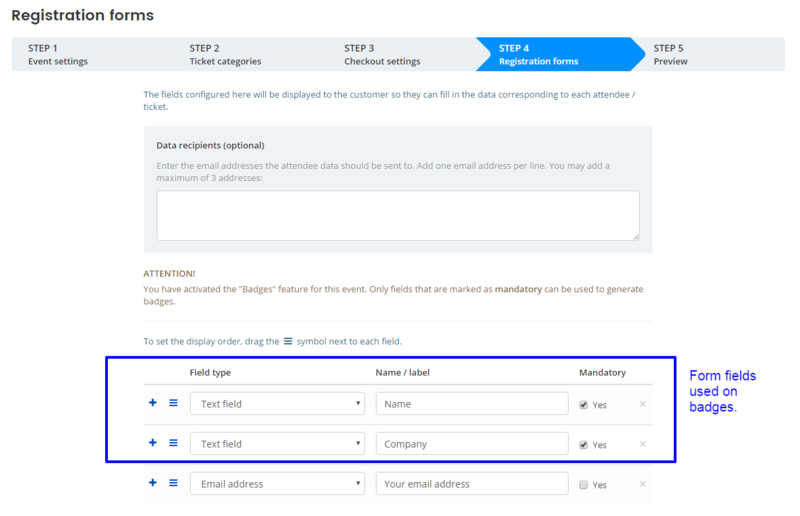 On the other hand, if you check With seating this will allow you to assign one of your previously created Event Venues (this is one of the major functions that Oveit offers and we’ll have a separate tutorial just for it). So, all you do now is to choose your venue and it will automatically sync the event with the venue’s seating map as you have designed it. Next you set the date and hour of the event and its length. After that is set, you move on and introduce a description for your event. Finally, you can choose whether you want to enable the Registration forms or Badge design functions for this event. If you enable registration forms, you will see that a new step appears before the Event Preview. If you enable attendee badges, this will be available to you in the Event Management Dashboard and you will be able to set up the badges after the event is created. Once you’ve done all this, click on Next Step and let’s move on. The next step is Ticket types. Here you will set up the different categories of tickets that will be available for purchase once the event is published. The first thing you do is set your ticket type name. You can set names such as VIP Area, Entry ticket, Early bird ticket etc. Obviously, the ticket type name is your choice and varies according to the events. You might want to create special prices for different areas in your venue, so you can name one ticket type Area A and another Area B. Again, this is your choice to make. Now, you can make a short description of the ticket (300 characters). Here you can add information about the ticket that might be relevant to the attendee. This is optional but sometimes it’s a good thing to have, as you might want to offer the attendee some extra features on that respective ticket. Or it may be a multiple day pass for a larger event and the description can indicate the events where he is allowed to participate. Next is the ticket price. You can set up the ticket price in USD and soon other currencies. Nevertheless, if you enter the ticket price “0”, that means the event is free of charge and you can go on using Oveit just as a registration tool for the attendees. After you set up the price, you can tick an option to include the sales fees in the final price, or opt to add it to your ticket price. You will see the buyer’s final price (and our fee) and you will see how much you will receive in the end. You will see a Bulk sales options bar. This is a nice feature in case you want to create special offers for a specific ticket category. Let’s say that your ticket price is 20 USD. Now, you can make a special offer and sell 2 tickets for the price of one. You add in the bar: 2 tickets cost 20 USD. And the offer is active. Simple and fast. Of course you can include our processing fee in the price or add it, just like in the case of normal tickets. And you can also add more promotions: 5 tickets cost X USD, 10 tickets cost X USD… and all the way to 15 tickets. If you want to remove a bulk sales offer just click delete and you’re done. Next you can set up the timetable of the sales for this ticket type. Set the starting date and hour of the sales and set the closing date and hour. If you want to sell this type of ticket until the event day, just leave the fields empty and Oveit will set it up automatically. Now you have to add the Series and the Numbers of the tickets, if you wish to do so. Otherwise, just let Oveit work its magic and generate the ticket ID’s automatically. Save the ticket and proceed. You can add more tickets, edit your created tickets and associate the tickets with the event venue. Once you click on the Associate Tickets you will be taken to a new window where you will see the seating chart of the venue that you’ve previously created. To associate tickets with seats is extremely simple. Just click on the ticket type and then click on the seat section… and that’s it. If you want to block some areas of the seating chart, just click on ‘Unassociated’ and then on the respective area, and it’s blocked. You can do that while sales are going on, as you might want to change ticket prices or you might want to assign some seats to other categories or even give invitations/vouchers for those seats. So with just a couple of clicks you can do your seat management on the fly with this Assign seats function. The third step is about checkout settings. This refers to everything the customer sees and receives via e-mail once he has purchased the ticket. First you have the ticket settings. Here you can attach the tickets to the order confirmation email or not. Why wouldn’t you want that? Well in case you create a badge for the event and that is the actual ticket for the event, you don’t need to send out the ticket anymore. The badge will be the ticket for your event. You can also decide whether you want to display the tickets in the order confirmation page that is available via email and you can also decide whether you want customers to see how many tickets are still available for the event. Many organizers do not want to show the customers how many tickets are still available, so the option of doing this is up to you. We can help you in both decisions. Next, you can opt to include the Oveit fee in the displayed prices. Obviously if you think that is unnecessary information you can just leave it unmarked. Now, there are several things that you can add to the email that the customer receives once he has purchased the ticket. You will see a chart with variables and their description. You have all the information you need there so we won’t repeat the information. What we can mention is the fact that you can write anything you want in the e-mail regarding the ticket and your event, and you can also add images in case you want to. Finally, you have the order confirmation page. Here you can opt to send a Thank you message that will be displayed after the customer has purchased the ticket or you can send him to a custom created URL on your website. To do that, just add the link and all is done. The last step is Preview. Here you can see how your event will look like. You can go back and change things if it is necessary or you can publish it and you’re done. Now all you have to do is get the event on your website and make it available to customers. To do that, click on ‘My events’ in the bar, right near the Oveit logo and go into the Events Dashboard. Here, you will notice that every event has an “</> Embed” button below it. Click on that button and you’ll find two embed codes (one available for light theme and one for dark theme – the theme refers to your website visual theme). Just copy the code you need and paste it on your website just like you would paste a Youtube code. The embed is responsive and works with every website software so you won’t have any problems putting it on your website in just a couple of seconds. And that’s it! You managed to create your event and put it on your website. Now customers can purchase tickets directly from your website and everything happens on your website. This concludes the first part of our ‘How to’ articles. We’ll be back a.s.a.p. with more information regarding the other tools that Oveit has to offer so that your experience with our platform will be a very pleasant one. So, once again, thanks for using Oveit!